A Fun Spy in Hopscotch! 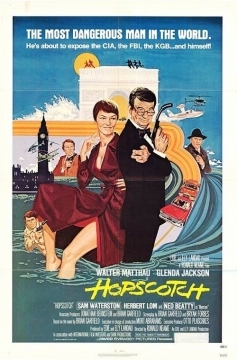 I love Walter Matthau, I love action, I love comedy and I love spies in movies and TV so this is a perfect film for me. I have been fan of spoofy spy movies since I was a kid. The first I remember seeing was Matt Helm series with Dean Martin. I just thought it was so funny and fun. So he steals and destroys his file and leaves the US to visit and ex-spy and old girl friend, Isobel played by Glenda Jackson. (she is such a great and funny actress it must be interesting seeing her dress down in opponents in Parliament. She became an MP for Labour in the 90’s. Great for Britain but we miss her wit in the movies.) One of my favorite scenes in the movie is their first scene together chatting about wine (LOL!). After everyone jokes with him saying “What are you going to do write your memoirs,” he decides to just that. To the tell the truth and to get even with that evil, bigoted head of Covert Affairs. So he writes an explosive first chapter with a very telling table of contents and the fun begins. The only person in the agency who is trying to keep his old mentor alive is Agent Cutter,( Played sweetly, with wit and compassion by the amazing Sam Waterston) Everyone else wants to kill him. The fun is watching Kendig outwit all the agencies in the world, exposing the bad guys in the agency while protecting the good. It is a such a fun ride, the first couple of seasons of Burn Notice reminded of me of this kind of movie before it got so serious. I would recommend it for anyone who likes fun, irony and adventure. This entry was posted in CIA, Hopscotch, Matt Helm, movie, movies, Parliament, Walter Matthau and tagged Burn Notice, Glenda Jackson, Sam Waterston by rithebard. Bookmark the permalink.